Average, well drained soil amended with compost. Seedlings tolerate light frost with protection. Established plants may survive winter in mild climates. Drench with a liquid organic fertilizer when plants are 4 inches tall. Potatoes, Basil, Mint and Tansy. Start seeds indoors in individual containers, or sow seeds outdoors half an inch deep and 2 inches apart. Gradually thin seedlings to proper spacing, and eat your thinnings. Older seedlings are difficult to transplant successfully. 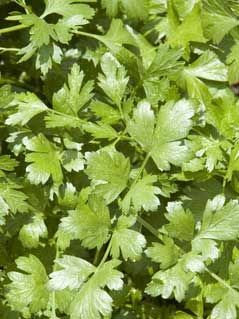 Cilantro seeds are the spice known as coriander. As soon as plants are 6 inches tall, pick individual leaves as you need them in the kitchen. Plants grown in spring often rush to produce flowers; fall-grown plants are often better producers.